Here you can find my collection of MacOS X tips and tricks. I will update this page time to time. Items are sorted in chronological order, most recent entries first. MacOS X evolves very fast, so please take into account that some tips may be obsolete, no longer accurate or even dongerous by the time you read them (posting dates available in update history page)! Check your MacOS X version and MacOS X manuals first! Additionally, MacOS X (unlike Linux) cannot be "repaired" by means of reinstalling separate software packages. If you accidentally screw up something inside MacOS X, most likely you will have to completely reinstall MacOS X. Sometimes, under rare and weird circumstances, PostgreSQL server may refuse to start on MacOS X with message "FATAL: invalid value for option 'LC_TIME': 'en_US'". To solve this, set LC_TIME to 'C' near the bottom of "postgresql.conf" located in $PGDATA folder (its location may vary depending on compilation and initialization options of PostgreSQL). PS. If you have problem connecting to PostgreSQL server after successful launch, this tip might help you. It may happen that you have folder(s) full of useful data on your media you wish to have full access to. You see them, but you cannot do almost anything with them. This stuff, for example, might be left from one of the other MacOS X user. 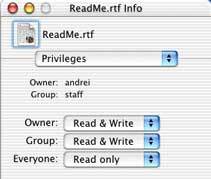 MacOS X Finder allows to change ownership and privileges of single files and folders, but this operation cannot be performed recursively (at least, in MacOS X 10.2.5 and earlier, Apple may change this in the feature). This task may be completed with various freeware and shareware utilities, however, in the terminal it simply faster (and NOT difficult as it may sound). Please remember: you should never perform change of ownership and permission on MacOS X system files and directories! It may render OS unusable or ill-behaved. First of all, you need to gain root (superuser) access. Then, type in terminal "chown -R -c" (without double quotes, with extra space after "-c"), drop folder on the terminal window (it will paste item and its path with necessary backslashes), and finally press enter. You will see console log which will list items with changed ownership. DivX is an extremely popular video format. Unfortunately, it was a headache for Mac users for a long time. On classic MacOS 8/9, it simply did not work well (video decoding was unacceptably slow and buggy). On MacOS X, official DivX plugin for QuickTime player seem to work fine for video, but in most cases required really awkward trick for audio track conversion since QuickTime 5 cannot play mp3 audio embedded into AVI files. However, after open source video players used primarily on Linux become available on MacOS X, situation changed dramatically. At the time of this writing (May 2002) there are two open source video DivX-capable players: MPlayer and VideoLAN. The first works in console mode and is controlled by AppleScript application (really odd beast), however, the second is the full featured Cocoa-based MacOS X native application. You may need to download and install open source ffmpeg QuickTime plugin in order to make them work. Please refer to the documentation files supplied with VideoLAN and MPlayer for more information. PS. Comprehensive DivX on MacOS X how-to is available at Project Omega home page. This topic is completely moved to "Safe and Happy UNIX Hacking with MacOS X". 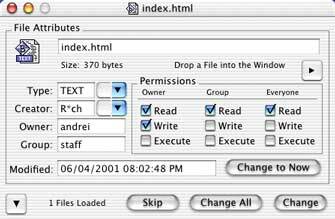 MacOS X client misses some very useful Open Source tools like bzip2, wget, Midnight Commander, MySQL, and some others. The best and safest way is to use Fink, a port of the package management system from Debian/GNU Linux (one of the most powerful and advanced this days) for MacOS X. More info available in another article "Safe and Happy UNIX Hacking with MacOS X". Anyway, you can always build necessary Open Source software yourself from the source tarballs. By default MacOS X Finder does not allow to change UNIX user, group and some other attributes. However, it can be easily done in terminal using "chown" and "chmod" commands. If you have difficulty using command line tools (or just don't like them) you can do this with shareware utilities - xFiles written by Brian Hill or XRay by Rainer Brockerhoff. Just launch xFiles/XRay and drop file(s) or folder(s) into the file info window. However, there is a one little problem - if you have launched xFiles/XRay from the MacOS X Finder you will not be able to do a lot because you will not be given enough access privileges to modify certain attributes. It means that xFiles/XRay have to be executed in superuser mode. First of all, you need to obtain a root password (see tip below). Then, open terminal and gain root access with "su" command. To launch xFiles from terminal run this command "/path-to-xFiles-application/xFiles.app/Contents/MacOS/xFiles" (in my case xFiles application is located in Applications folder inside my MacOS X Home directory I run "/Users/andrei/Applications/xFiles.app/Contents/MacOS/xFiles"). This process is simpler with XRay which may re-launch itself in superuser mode. PS. After all, it may be better to learn how to use UNIX "chown" and "chmod" commands. Typing commands in terminal might be just much faster than locating, launching and customizing GUI utility.However, having choice is even better. Soon after I posted this topic I found how to do the same much better way. You need to install Fink (port of extremely powerful and capable Debian Linux package management system for MacOS X) and MySQL built as deb. Fink maintains its own directory tree which is visible in the MacOS X Finder. More info available here. By default MySQL keeps its data files in UNIX directory /usr/local/var which is not visible in the MacOS X Finder. However, with little effort you can move them where you like. In order to use MySQL you need to add mysql user in MacOS X (see instruction below). MacOS X automatically will create mysql home directory, which, in turn, contains standard directories like Documents, Library, Public, etc. It is not recommend to use any of these directories (MacOS X may reset permissions for these directories to defaults anytime), but rather create a folder inside mysql user home directory (e.g. MySQL-Folder, please avoid spaces), set read-write permissions for this folder for mysql user, read-only for group and/or others (so you can backups MySQL files without logging as mysql user), and move MySQL data files there in terminal using "mv" command. However, this is not everything, you need to tell MySQL where to look for data files. There are 4 template configuration files, each of which optimized for certain RAM amount available. If you run MySQL on local workstation, just take "small" one. Run "open -a TextEdit /usr/local/share/mysql/my-small.cnf" in terminal, and save it somewhere in your home directory as text-only (not RTF) file with name "my.cnf". Set permissions using Finder Get Info -> Privileges (or use "chown" command in terminal) for this file as read/write for yourself and readable for everyone. If you do not do this MySQL daemon will not be able to read, or you will not be able to modify it, you have always remember that MacOS X is a UNIX! Next, set these variables in my.cnf file. Then, copy updated "my.cnf" into /etc directory ("cp my.cnf /etc/my.cnf") and restart MySQL daemon in terminal. If everything is OK you will see message "Starting mysqld daemon with databases from /Users/mysql/MySQL-Folder". This tip is obsolete if you have MacOS X 10.2 Jaguar or later. MacOS X client version starting from 10.1 includes client for Windows networks, but not server without which it is impossible to connect to ordinary MacOS X workstation from Windows box. Fortunately, MacOS X Windows-compatible networking is based on Samba (industry-strength open source project). Project called Samba X adds missing part and enables Windows file sharing services on MacOS X. You can use Cocoa-based SSCT (Samba Server Configuration Tool, entry level) or Web-based SWAT (Samba Web Administration Tool, experts level, included with Samba distribution) for configuration purposes. In order to use SWAT, launch Web browser and connect to "http://your-server-IP:901". However, you will need root password to use SWAT. In order to remove Samba run "sudo /usr/local/samba/removesamba" in terminal. There is one quite simple way to reveal some hidden MacOS X UNIX underground without using terminal. Download freeware Tinker Tool and turn on "Show hidden and system files". However, you should be very careful and not move or delete UNIX stuff. If you have Netatalk v1.4.x (AppleTalk via TCP/IP emulator) on Linux or free BSD you may notice that you will be no longer able to connect to shared volumes from MacOS X (at least, this is true for MacOS X 10.04 and below). However, there is one very simple trick to solve this problem. Launch Classic, than famous Chooser accessory and connect to Netatalk share via Chooser. PS. Netatalk 1.499 solved this problem. This article have been completely rewritten and moved to separate page. Since MacOS X core called Darwin based on BSD Unix, many Mac users probably will be very interested to know some MacOS X underprintings. Additionally, it will definitely help you to become the ones who are usually called "power users". If you will be very careful, there will be no harm to use this power. UNIX is multi-user system from the ground up. One of the aspects of this feature means that every entity of OS (including files and folders) belongs to certain user and group. Each user (which, in turn, belongs to particular group) is permitted to read, modify or execute them according to privileges (read/write/execute). In MacOS X client version there are two types of publicly "visible" user groups determined in System Preferences -> Users: "wheel" group with administration privileges (system administrators or sole users of MacOS X) and "staff" group with administration functions disabled (usually ordinary users). When certain user log in into the System, he can see, modify and execute only things he allowed to according to privileges. Whatever you have created in MacOS X Finder and applications will automatically belong to the current user and the group staff. However, this is not true for some UNIX software like system daemons (e.g. MySQL). By default MacOS X Finder do not allow to change user and group. However, it can be easily done in terminal. If you have difficulty using command line tools you can do this with shareware utility called xFiles written by Brian Hill (see tip above for more info). UNIX has one special user called root. Root is a supersuser which is allowed to do anything. 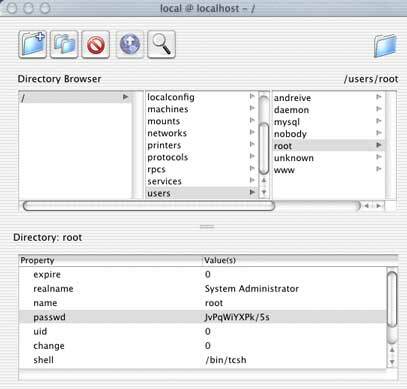 Root is not listed in MacOS X login in order to prevent damage of system components, but you can still login as root using terminal (this procedure in detail described here). / Root directory, everything, including mounted volumes (in UNIX they are represented as directories) is inside this directory. /etc Configuration files, analog of Preferences folder in classic MacOS. UNIX configuration files are plain text files and thus, may be viewed and modified using text editor. /home Private directories of the users, in MacOS X it is named "Users". /lib Shared libraries, in MacOS X named "Libraries". /usr UNIX system resources. This directory includes essential UNIX components like source code, help files, various scripts and executables. /var Variable data (mail, databases, print spool files, log files, etc.) belonging to certain software packages (mail/Web/database servers, print spoolers, etc.). Please note that directories listed above are not necessary located in root level (like on Linux). Many of these directories in MacOS X are inside directory called "private" which is hidden by MacOS X Finder. UNIX file and directory names are case sensetive, directory names are separated with slash "/", invisible items started with dot ". ", that's why they are often called dot items by UNIX users. All UNIX related directories and files of MacOS X (hidden when MacOS X is running) are visible and modifiable from classic MacOS resource editor like ResEdit. However, editing MacOS X components from classic MacOS is really bad idea. MacOS X inherits from UNIX a vast number of GNU utilities like compilers/interpreters for popular procedural and object-oriented programming languages (C/C++, Java, Objective C, Pascal, Fortran, etc. ), high-level scripting languages (PERL, PHP), archiving (tar, zip, pax), networking (Apache, Samba), and a lot lot more. It means that much of software from FreeBSD and Linux without GUI, with Web or Java based GUI, or (in general) with GUI which is not dependent upon open source (like Gtk) or proprietary GUI libraries not ported to MacOS X may be used on MacOS X just after recompiling. This time very popular GUI library called called Qt (the heart of KDE) which have been available on Linux and FreeBSD for a very long time is already rewritten for MacOS X. Additionally, project called X Darwin is aiming to bring XFree86 windowing system on MacOS X (using XFree86 on MacOS X is a pure hacking). However, there is one area where MacOS X 10.1 lags a miles behind Linux - its a package management system with central search-able component database, or, to be precise, complete lack of one. MacOS X installs as a single whole (only few language kits, some BSD components and few printer drivers may be omitted during installation), compiled UNIX software on MacOS X is being thrown into the system without registering with package manager which offers system-wide component search-able database and uninstall features (although you can see which files are going to be installed and view installation log in Apple Installer, or take a look in BOM - Bill of Material files after installation). In Linux, one can query RPM or Debian dpkg package manager in order to see which files belong to particular software package, what exactly this package does, when it was installed, and of course, you can test if selected package can be safely installed, upgraded or removed without conflicting with or breaking other software. Although some MacOS X native applications (which are actually folders with components inside and name extension ".app") may be safely removed manually by dragging them into the trash, it is not true for UNIX inherited software which may consist of hundreds or even thousands of files scattered across private UNIX directories which are not visible in MacOS X Finder. Uninstalling such software manually in terminal may be a time consuming and painful process. Open Application -> Utilities -> Terminal. From here you can almost completely control your MacOS X box. Type a command and press Enter to execute it. You can open as much windows in Apple Terminal as you want. If you close terminal window you will kill the process executed from this terminal. To interrupt time-consuming command gracefully use Control-C. Please note that all UNIX shell commands are case sensetive. In order to avoid typing path names too often, you should set up current working directory. It is something like opened folder window in the Finder. Below you can find very short and brief list of some shell commands. man display the on-line manual pages You will use this command very often, at least at the first time. Example "man find", "man cd". Use return to scroll down long manual pages, type "Q" to quit. pwd prints the absolute pathname of the current working directory Use this shell command to understand where you are. cd change current working directory Example: "cd /Users/Shared". You can drag and drop MacOS items to terminal window in order to avoid typing absolute path manually. ls list directory contents Use "ls" without arguments to list content of the current working directory, "ls -a" to get list with invisible items, "ls -l" (lowercase "L") for detailed information, or combined "ls -al". find find something inside gived directory Example: "find /Users -name "*.app" -print" - finds and prints all MacOS X applications inside "Users" private directories (MacOS X native applications are actually the folders with extensions ".app", "*.app" means anything which ends with ".app"). With "find" you can locate UNIX items which are hidden to Sherlock. open open files and directories Use "open -a TextEdit ..." to open and modify UNIX configuration files not visible in the Finder and not accessible from System Preferences, for example "open -a TextEdit /etc/httpd/httpd.conf" will allow you to view Apache configuration file. su substitute user identity Run "su" without extra arguments, and after authentication you will be logged on as root. sudo allows a user to do a command as the superuser or another user Run "sudo open -a TextEdit /etc/httpd/httpd.conf" in order to view and modify Apache configuration file. chown change ownership of a file or directory Read any UNIX command reference in order to learn how to properly use this commnd. Since MacOS X core based on BSD UNIX, it is sometimes necessary to gain root (superuser) access in order to access some MacOS X hidden features. Root (superuser) access is strongly discouraged for anyone who is not familiar with UNIX! Unlike Linux, MacOS X cannot be "repaired" by means of reinstalling separate software packages. If you accidentally screw up something inside MacOS X, most likely you will have to completely reinstall MacOS X. The simplest way - open terminal and run "sudo passwd root". You will be asked for administration password, and then you can define root new password. If this does not work, follow instruction below. Login to MacOS X as administrator (first user created during first installation of MacOS X is always administrator, however, not root). Open Application -> Utilities -> NetInfo Manager. Run from menu Domain -> Open. Type "security" after "/" (slash) and click "Open". You will be presented with this dialog. Select Users -> root in the list and choose from menu Domain -> Security -> Authenticate. NetInfo Manager will ask for administration (not root!) password, enter it and click OK. 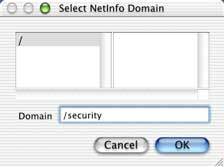 Select from menu Domain -> Security -> Change Root Password. Enter new password (and make sure you can remember it). Quit NetInfo Manager, then open Applications -> Utilities -> Terminal, run "su" (substitute user identity) command, and after authentication you will be granted with root access. Please note that even if you gain root access, nothing will be revealed in the Finder. All hacking have to be done in terminal. Check you hard drive with disk utility like Apple Disk Aid, Norton Disk Doctor, or just any other you trust. Backup your (and all other users !) data from "Users" folder. If you have UNIX software packages like MySQL or PostgreSQL you also need to backup their data files located usually inside /usr/local/var directory. It is not visible in the Finder, so you have to use terminal. Trash or immediately erase visible MacOS X folders - Applications (not "Applications (Mac OS 9)"! ), Library, System, Users; plus files called mach and mach.sym. Use ResEdit or any other utility to make visible and erase the following hidden MacOS X folders and files on the root volume - automount, bin, dev, mach_kernel, Network, private, sbin, usr, Volumes, .Trashes. Please note that UNIX-specific MacOS X folders like "sbin" may contain thousands of items. If you reinstall MacOS X on the same volume you will notice that orphaned UNIX symbolic links become something like "tmp (Mac OS 9)", "var (Mac OS 9)", etc. Do not move them and their content in Trash! You may delete important UNIX components! To erase them, open terminal, gain root access (read above how to do this), run "cd /" to switch to root directory, and then "rm 'cores (Mac OS 9)' 'etc (Mac OS 9)' 'tmp (Mac OS 9)' 'var (Mac OS 9)'" (rm means remove, it is safe because without extra option it cannot remove directories). You have to enclose directory names in quotes because they contain spaces. Do not use "rm -R *"(Mac OS 9)""! It will delete your "Applications (Mac OS 9)" folder.